Sebastian man arrested on charges of Felony Aggravated Assault With Deadly Weapon, Felony Shoot or Throw Deadly Missile, and Felony Criminal Mischief. Photo by Indian River County Sheriff's Office. 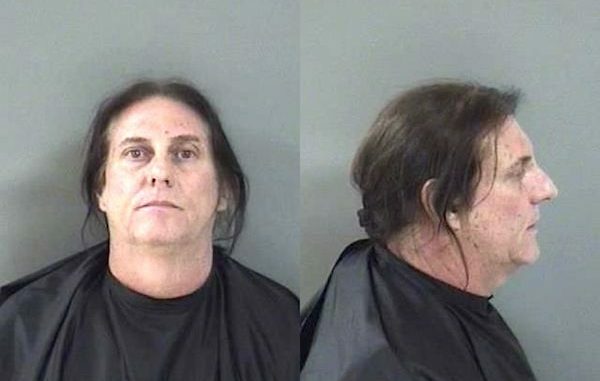 SEBASTIAN – A 54-year-old Sebastian man was arrested after he shot a high-powered air rifle at his neighbor, according to the Indian River County Sheriff’s Office. On Wednesday, deputies responded to a call about shots fired in Sebastian at approximately 6:00 p.m. They met with the victim who said his neighbor, later identified as Greg Allan Jammel, shot a BB gun at him while he was retrieving his cell phone from inside his truck. “After hearing the air rifle, he then heard a loud noise on the passenger side of his truck from what appeared to be a projectile hitting it, followed by what he could identify as a BB round from a BB gun bouncing on the driveway,” the deputy said. The victim was in fear for his life, that he was being shot at, and retreated to the inside of his carport for cover. Once there, he observed Jammel running away while holding what appeared to be a buttstock of a black rifle. The victim also told the deputy that Jammel was following him earlier that day in his red Ford Mustang on his way to work. He said he’s never had dealings with the suspect other than the BB gun and doesn’t know why he would be targeting him. Several deputies went to Jammel’s residence, located across the street from the victim, and knocked several times on the door. Jammel was eventually taken into custody. The suspect told law enforcement that he was just outside doing target practice and that it must have been a ricochet that hit the victim’s truck. “Jammel went on to say that he was shooting a BB gun pistol and that he shoots at a box in the front yard,” police said. After granting deputies to search his residence, a CO2 gas propelled BB gun was recovered. Also recovered was a high powered air rifle matching the description that the victim gave. Upon retrieving the black air rifle, it had a stamp on it stating that the pellets fired from the gun travel 1,000 feet per second. A pellet that fast is faster than the average .45 caliber bullet fired from a law enforcement weapon, according to Det. Prouty of the Indian River County Sheriff’s Office. A pellet that fact could cause great bodily injury or death. Jammel was arrested and charged with Felony Aggravated Assault With Deadly Weapon, Felony Shoot or Throw Deadly Missile, and Felony Criminal Mischief.